Trump Administration Will Let States Require People To Work For Medicaid : Shots - Health News Ten states have already asked the administration to add work requirements to the popular health insurance program for low-income people. But many recipients are already working. 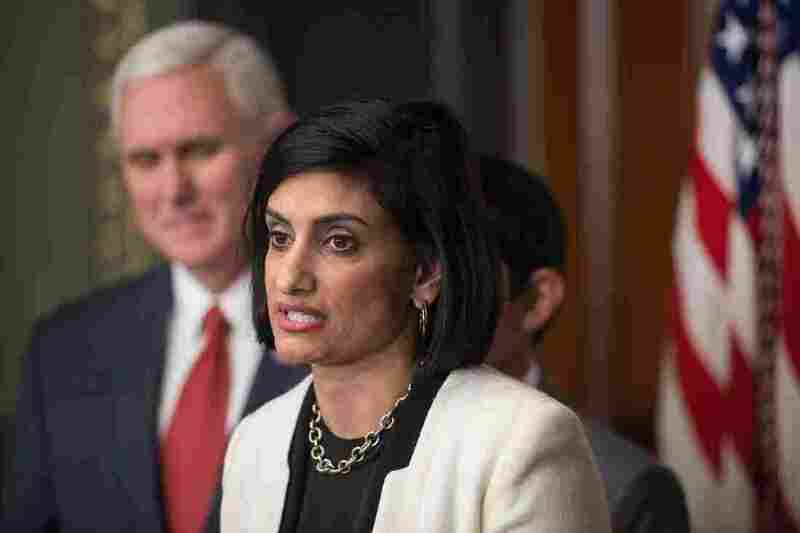 Seema Verma, administrator of the Centers for Medicare and Medicaid Services, led efforts to require work for Medicaid recipients while in charge of Indiana's program. She was sworn in as administrator of the Centers for Medicare and Medicaid Services by Vice President Pence on March 14. CMS Administrator Seema Verma said on Twitter that the new efforts will "improve Medicaid enrollee health outcomes by incentivizing community engagement." "This is about helping people rise out of poverty," Verma said Thursday in a conference call with reporters. "Access to Medicaid makes it easier for people to look for work and obtain employment," says Suzanne Wikle of the Center for Law and Social Policy. "A so-called work requirement does not support work but instead puts a critical support for work at risk." But it's not clear how many people would be affected by the new rules. A study in December in JAMA Internal Medicine found that about half of the Medicaid recipients in Michigan were already working. In addition, people who are disabled under the Americans with Disabilities Act but have Medicaid benefits for another reason could be exempted, or the state would be required to make "reasonable modifications" such as a reduced hourly requirement to ensure that the requirements don't disproportionately hurt people with disabilities. And states are also required to make such accommodations for people with addiction to opioids and other substances. That could mean counting time spent in drug treatment as a form of "community engagement." "There are a lot of different ideas, and a lot of ways to go about this," she said. "We want to give states as much flexibility as possible because that's where we'll be able to evaluate what actually works best."